Alcohol related gift idea - nice glasses for drinking spirits? 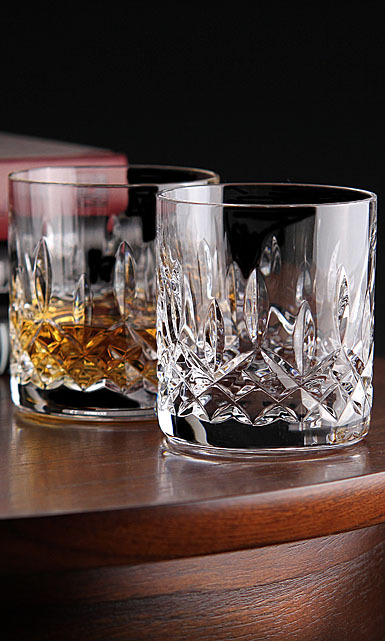 I'm thinking about getting a good friend some nice glasses for drinking whiskey (on the rocks or an old fashioned) and other spirits. I may want to get them personalized too. Any recommendations or another gift I could give someone who enjoys an occasional drink? Maybe a drink recipe book? Re: Alcohol related gift idea - nice glasses for drinking spirits? Good old Waterford Lismore drinkin' tumblers. Sit nice and heavy in the hand. Whiskey drinker here. An important accessory is an ice tray that makes large cubes or large spheres of ice. These melt slower, allowing the whiskey to be chilled without as much dilution. There are also clear ice trays that make, you guessed it, clear ice. But those are somewhat pricey and you might not like the recipient that much. Whiskey drinker here. The suggestions above are excellent. If you're looking for something a little more unusual, I really like the Norlan whiskey glass. https://norlanglass.com/ It wouldn't work if you're friend usually drinks on the rocks, but they are great and really nice looking for neat drinks. It looks like they are coming out with a tumbler, which I may investigate once the price comes down a bit. For the most part, ice cools things by melting. If you slow the melt, you slow the cooling. Good suggestions. I'd like to keep the price around $50 or less. He actually gave me a large sphere ice tray one year. I have a set of Baccarat double old fashioned glasses that I’ve owned for years. Nice weight and quality. They, plus a generous splash of Woodford, never cease to put a smile on my face. Whiskey drinker here. All of the above suggestions are excellent. I have a wonderful set of good, heavy old fashioned glasses from (I think) Williams Sonoma. Looking at their website I don’t see the exact ones I have, but it appears they offer monogramming of glasses. I like tulip shaped glasses for drinks where the aroma should be more concentrated. I've found this useful on beer, whiskey, and wine too. I am not a big fan of my whisky being on the rocks (or even one big rock) and only drink cocktails at bars, most of the time it is just neat and room temperature. I have a whole slew of glencairn glasses that work great and highly recommend them. This! Totally agree. If he is a whiskey fan, liked Old Fashions, etc these large cube trays are the perfect gift. I got some last year and love them. There is something called a "Glencairn" glass that is made for drinking whiskey and similar spirits. The shape helps funnel the aroma to the nose to aid in tasting. I have some, I'm no expert so I can't for certain say they are better or worse, but they are a different experience that a traditional tumbler. For several years, I have routinely asked family for such a gift. The choice is Waterford crystal, as another person mentioned. Go to Kinsale.com and look at several types of tumblers, water glasses, shot glasses, decanters, etc. They have a wide variety of items, and they offer an opportunity for collecting several types if you happen to want to have friends/family give them as gifts. Typical items are approximately $70-75 each, though items such as decanters can be substantially more. If timing is not a primary issue, they offer a 20% off sale each January. The company is based in Ireland, and they use older, Waterford designs. I keep a set of these stainless steel balls in my freezer for those that like neat drinks and other people who like cold wine. I also use them when I forget to chill the white wine. They work great. Is kinsale.com the right sight? I got an error.